In the demo you can create NewsCharts for stocks traded on the US & international markets. You also get instant news alerts for S&P 500 companies. Top money managers and hedge funds realize the importance of stock news. But most investors are missing out on opportunities to make phenomenal profit from the news. Or even worse, they can't track the news in their current investments! The reason investors don't take advantage of the news is obvious - It's too hard! It can be very difficult to keep up to date and understand the importance of the news. 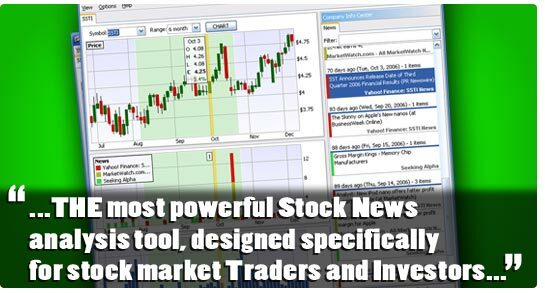 Once you Try Stock Spy we think you&apos;ll agree that it&apos;s a groundbreaking investor tool which unleashes the potential hidden within stock news. Stock Spy enables you to easily visualize and pinpoint important company events directly on a stock chart to make smart investment decisions, faster! You can quickly see where a stock has been, where it's going and why. It gives you the edge, whether you are a professional trader, an individual investor or brand new to the stock market. "I just wanted to commend you on the exceptional job that you have done creating this software. 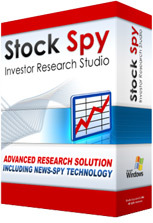 Stock Spy is an incredibly powerful software product. It saves so much time in news research by compiling all of the various news sources on the internet by symbol and the way that it associates news events with stock charts is simply ingenious! Being able to find news from so many sources in such a timely manner will be invaluable. I can&apos;t believe that the software only costs 199.00! My previous news service was costing me $100.00 per month and it wasn&apos;t nearly as powerful as your product. I&apos;m glad that I found Stock Spy as I searched Google for RSS feeds. Here&apos;s a BIG thank you!" Stock Spy's unique NewsChart technology makes it easy to see correlations between stock news and stock price activity directly on the stock chart . This is extremely useful for finding catalysts for short and long term trends. "Cause-and-effect" analysis is literally dead easy when you see the news plotted together with the stock price. This means it's easy to quickly bring yourself up to speed on what is happening in a new potential investment. Researching and analyzing stocks is boiled down to a simple procedure of clicking and selecting dates which catch your attention by simply glancing at the chart (For example: days with higher than average news volume, trading volume, or which immediately preceded a substantial price move). Once you visually select the dates on your screen, relevant headlines are instantly displayed for your selection. Then, if you want to get more in-depth information, you can click headlines in the "News" tab to directly access the source news article with your web browser. Stock Spy provides instant as-it-happens desktop alerts which are vital to making quick profits and avoiding devastating losses. Alerts are organized by ticker symbol so you know you're getting information which is laser focused on stocks that are important to you. Not just a general review of what happened in the markets that day. The time-saving FinanceTerms automated textual news analysis features are also incorporated into the desktop alerts - allowing you to analyze and react to news much more quickly. Unfortunately most investors don't have this kind of instant stock news alerts and consequently miss out on huge profits or get hammered when negative news breaks. "You folks have thought of everything... vbg [Very Big Grin]. I'm brand new to Stock Spy but already appreciate its tremendous value. I'm a Briefing.com Platinum user. Your program alerted me to news on GBT this morning allowing me to sell for very nice profit. The alert quoted Briefing.com as the source. I would have overlooked this alert the way I had been using Briefing.com. Thanks again for a GREAT and most useful program." Know before it's even news! Sometimes news which comes from the mainstream media is already anticipated and is said to be "priced in". But, you can receive news before it hits the mainstream media by adding targeted RSS feeds. There has been a recent explosion in the number and type of RSS feeds available to the investor community. Add feeds for employee or expert blogs, special interest sites, corporate news feeds, stock discussion forums, search engine RSS feeds from Google or MSN to name just a few. This creates an "Underground News Network" which can keep you ahead-of-the-curve and allow you to make phenomenal profits by taking advantage of opportunities early before information diffuses through the mainstream news media. You can assign any number of feeds to a ticker and the new feeds will be automatically color coded when you chart them using the NewsChart system. You're invited to learn about some of the key benefits of StockSpy by hovering each of the blue "hot-spots" with your mouse on the StockSpy interface below! Each time you chart a new symbol StockSpy automatically configures feeds for that company from top financial news providers: Yahoo! Finance, MarketWatch.com & SeekingAlpha.com. This provides a complete picture of what is happening in a company without the time consuming effort of manually visiting mutiple websites for each company (and still not knowing what is happening!). StockSpy supplies a full RSS feed control panel to enable easy customization of the feeds which are associated with each company symbol. This opens up huge number of possibilities such as feeding search results from web search engines, feeds directly from website of the company you're tracking, or any financial blog which offer feeds. For example, it's simple to add a custom news feed of a competing company to see how the actions of the competition affect a stock's price. StockSpy constantly keeps news updated so you always have the latest and most time-critical information. Pinpoint exactly what you are looking for. Filter large sets of feed data by keyword as-you-type. With live filtering you can quickly spot analyst upgrades/downgrades, SEC filings, earnings reports, all articles from a specific source, company/industry specific keywords or filter by any other keyword imaginable. You can save useful filters to reuse in the future. is the only application that lets you see exactly when news happened and how it affects your investments. StockSpy generates an interactive bar chart with the size of each bar representing the number of news items for that day! News from different sources is color coded to make it simple to identify where the news came from. FinanceTerms is another StockSpy first. It's the only system which scans and groups stock news by keyword so you can quickly find the type of news you're looking for. FinanceTerms integrate into the StockSpy price chart, displaying color coded markers for dates where matches are found. It's a powerful investor news mining system which provides the specific results you're searching for. You see instantly when certain events occur (Upgrades, Downgrades, Announcements, SEC filings and much more). Create charts of any size & quickly access to vital chart statistics with dynamic mouse hover overlays. Dig deeper with direct access to full news stories. You can easily read news stories in your web-browser by selecting them in the StockSpy graphical user interface. Free unlimited access to stock price and volume data. Free unlimited access to news feeds for specific symbols from top-tier news organizations: Yahoo! Finance, MarketWatch & SeekingAlpha. Give me Full StockSpy Access NOW!